In this article I’ll go through a few DC motor (and as a matter of fact complete mechanical system) models of various complexity. Most of the discussion is centered around coming up with equivalent electrical circuits, because – well, because I’m an electrical engineer. The article will go into quite a bit of detail, but don’t feel obligated to read through the whole thing. You can gain quite a bit from reading the first chapter alone. If all you care about is a simple motor model that works well for sizing H-Bridges, this is the only chapter you need to read. The model introduced here doesn’t account for the effects of mechanical components. It treats shaft speed as a constant. This model will not be useable for control applications, where you try to electrically compensate for the effects of mechanical components. The main assumption in the model introduced here is that the mechanical time-constants in your system are much higher than the electrical ones. That’s true in almost all cases, but you would need to read through the rest to understand why. With that, let’s jump right in! In both cases, all the elements are in series, so the share the same current. We’ll denote it with ‘I’. In this simplistic model, the moving part of the motor (the rotor) has some moment of inertia (Jm) and some friction (fm). The remaining letters on the image are: ‘T’ for the torque on the motor and ‘s’ which is the rotational velocity or speed. An ideal motor has no losses, so fm is 0. Normally introductory texts use viscous friction to model mechanical losses in the motor, due to its linear behavior. However that model is way too simplistic to be practically useful at least in my experience. So while the model I’m using is very similar to the one introduced here for example: http://www2.ece.ohio-state.edu/~passino/lab2_rotary_dynamics.pdf, we will have to take some non-linear behavior into consideration. In many cases, you can use this model for the whole mechanical portion of your design: it basically describes a motor driving a mass with some loss. This is a good enough model for example for the drive-train of a wheeled platform (an R/C car or a mobile robot), as you will see later. The model gets more complicated of course if you need to consider springs or spring-like elements. For belt-drive mechanics for example, this model cannot be accurately used. If you start considering highly non-linear effects in the mechanical (or electrical for that matter) domain – effects of wind-resistance for example – things get even more complicated but I will not consider those problems here. So, in the ideal case, the two conversion constants are identical. Now, on the mechanical side, we have a rotating mass and friction to consider. These ‘elements’ are on the same rotating shaft, so their rotational velocity – speed – must be identical. Each of them will exert a torque on the shaft as they are moving, but the relationship between the speed and the torque is different for each of the components. 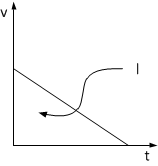 Tf = sign(s) * fm, where fm is a constant describing the amount of friction. Keep in mind though, that friction is a non-linear element, so as soon as we consider direction-changes, the first, more complex equation needs to be used. The rotating mass of the motor introduces a torque that’s proportional to angular acceleration, or the derivative of the speed. The mass accts against change: it’s torque will try to counteract acceleration, but just as above, I’ll leave the negative sign out because we’re investigating from the systems’ perspective. Our goal is to find electrical components (resistors, capacitors, inductors etc.) that – from the electrical side – look just like these mechanical parts do. We have to answer two questions: what those components should be and how to connect them together? But just how useful this model is? To be honest not terribly, as you rarely use a motor without anything connected to it. Modeling the mechanical properties of just the motor is not that practical. Luckily, the same model can be used for a wide range of applications, for example for moving platforms. In this example, I’ll dust of my old Tumbleweed robot. It is based on a Stampede R/C car. A first-level mechanical model is fairly simple for this kind of platform: the motor through a number of gears, drives a wheel, which than moves the whole body. Here, the motor is represented by our usual model of a lossy rotating disc (parameters with the ‘m’ suffix), and our load is represented by another lossy rotating disc of the same kind (parameters with the ‘w’ suffix). Models of course are only useful if you can actually model something with them. And in order to do so, we have to be able to come up with actual numbers of these letters. So let’s see how we can do that! That’s a lot of capacitance! As for the current source, I did a little experiment. From the electrical equivalent we know that if we don’t connect anything to the wires of the motor, the only thing that drains energy out of the system is the current source that represents friction. So, if I start moving my little robot with the motor open, than let it free, its speed should decrease linearly until it comes to a halt. By measuring how long it took it to stop and how far it went I can calculate the friction that was in action. fw = 2.044 N * 4 cm = 81.78 mNm. Let’s see now, what we can learn from these numbers! First of all, the If current tells us that we need to pump ~0.5A into the motor just to keep the car running at a constant speed (on this particular flat surface anyway – friction is highly dependent on the surface and slope introduces another type of mechanical element we haven’t talked about). Being a simple-enough circuit, it’s easy to calculate the parameters of this curve. The center-frequency (resonance) is at 1/(2π*sqrt(Lm*C)) = 17.5Hz, but the Q of the circuit (sqrt(Lm/C)/Rm is low, only 0.006. That’s why you see such a flat response around the resonance frequency. The lower cut-off frequency is determined by C and R and is at 0.11Hz, the higher cut-off frequency is determined by Lm and R and comes out at 2.6kHz. Not surprisingly, you get a low-pass characteristics, with the slope of the attenuation starting out at 20db/decade and increasing to 40db/decade after the 2.6Khz mark. Now, remember that current is related to torque and voltage across the capacitor (Vg) is related to speed. What these plots tell us is that beyond 0.11Hz we don’t have too much hope to influence the speed of the motor. Two decades above that, at around 10Hz we might as well as forget about it: the speed will not budge. This is important when you try to design a speed control loop. It tells you what you’ve probably already known before: mechanical systems are slow to respond. What might be a little surprising is that the cut-off frequency is not entirely determined by the mechanical elements: it is a function of the inertia of the rotating mass (the capacitor) but also of the motors internal resistance (Rm). But if you think about it a little more, it’s not that hard to understand: a lower internal resistance motor will be able to influence the speed of load quicker. Another thing that these charts tell you is (and this might sound counter-intuitive) that at DC you won’t be able to put any torque on the motor. At first that doesn’t seem right, is it? You definitely can load down a motor and get some torque out of it! Well, in fact you can do that, but we’re talking about something else here: can you change the torque of the motor without changing the load on it? It turns out you can’t, and if you think about it you’ll see why. Let’s say you try increasing the voltage applied to the motor in hopes that it will increase the current, thus the torque on the shaft. What will happen is that for a short while in deed the current will spike up, but the extra torque will be used to speed up the shaft. That speed-up in turn will increase the generator voltage and lower the current. By the time the transient is over, your current is back to where it used to be, only the speed of the shaft got higher. Of course there’s some DC current going into the motor as well to compensate the frictional losses – we’ve modeled that with the current source – but that’s not torque you can get out of the system. Internal loss is also the reason why you can put a DC current through a motor, when the shaft isn’t turning at all. In that case our kinetic friction gets replaced by another type of friction – static friction – that is consuming some torque. Its that static friction (or it’s electrical equivalent) that your can push some DC current through in a stationary motor. Static friction however is highly non-linear and in general nasty enough to model, that I left it out from this discussion. Let’s now move on and consider the upper end of the frequency spectrum. One thing immediately should be obvious: beyond a 10Hz or so, the capacitor voltage (shaft speed) has so much attenuation that you can consider it constant. Since almost all PWM drivers operate beyond this frequency, they should not be concerned by the voltage (speed) fluctuations during a cycle. This is the explanation why we started off our motor model with a constant voltage source and this is why that’s a good-enough approximation for H-bridge design – not for speed-controller design though! If we increase the PWM frequency beyond the second corner-frequency – 2.6kHz – the current will not be able to keep up with the voltage changes anymore. As you move into this region with the switching frequency, your current wave-form will look more and more like a triangle wave and the current amplitude (called ripple-current) will start decreasing dramatically. If you look at what determines the second corner-frequency (Rm and Lm), you’ll see that it’s only determined by the motor parameters and is unaffected by the load. It is usually a good idea to set the PWM frequency beyond this cut-off frequency to reduce ripple-current – which translates into extra loss on the internal resistance. It’s good news that you can set this frequency without looking at the loading and the mechanical environment the motor is in. What does that mean? It means that at our resonance frequency (17.5Hz) the motor inductor and the rotating mass will start resonating. If we have input into the system at or around that frequency, the energy will hang around in the system for a long time, creating unwanted vibrations. Those vibrations can affect mechanical accuracy, shorten component life or even threaten the integrity of the system. I’m also planning on another article to dig even deeper into motor modeling, so if you’re interested check back soon for more! Great article! Well written and clearly explained.